Candie Cooper has written one of the most fun books I've ever seen, just full of projects that you won't be able to wait to try. The title? Necklaceology! Candie has arranged her book according to the length of the necklace project, so you'll find sections on collars and chokers, princess-length, matinees, operas, and ropes. Certainly many of the projects could be re-worked to end up being your favorite length, and in fact, Candie does show several tips along the way for how to accomplish that with style. There is a very good beginner technique section too. This book is not for those who are looking for earth-shattering new techniques, though. Instead, it's really been written for those who would like to stretch their own design aesthetic and gather up some new ideas for how to combine mixed media materials with flair. Candie-style flair! And here's a bonus: if you're not sure, check out the free downloads that the publisher, Lark Publishing, has made available! I am particularly fond of the Safe Keeping necklace that she shares here, and I will probably be making one soon! But wait, it gets even better! 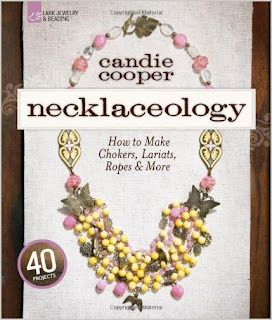 Now you have a chance to win a copy of Necklaceology right here! That looks like a really fun book. Would love to win. My e-mail should be in my blogger profile. What a marvelous book I would love a chance to win it! Thanx for the chance to win this book. It is one I have on my list to purchase the next time I order books. It would be great to win it. I just tweeted about your book giveaway. I like Candie's work & I think this book would be great to add to my library. Thanx for the chance. Thanks for the love! Good luck, gals!! This book looks very interesting, and I'd love to win it! Thanks for the chance! This looks like a great book! Would love to win it so I could try my hand at making some of them! Just tweeted and posted on facebook! Thanks for the extra entries. I would LOVE LOVE LOVE to win this! Might help me out! Necklaces are the hardest for me! Thank you for the chance to win! i would really really really really really really really really really did i say really love to win this book!!! Book looks really interesting. would make a lovely early birthday present for myself. Birthday on the 11th... Thanks for all the info you give to all of us. Wow! Looks like a great book I'd love to win. I would love to win this book as necklaces are my favorite thing. Looks like a very interesting book. I would love to have it in my collection! Always a great thing to read a book review when you are thinking about buying it. Love getting free things too. Love the name of this book and it sounds really great. I love a fun book with great instructions and ideas! I would love love love to win this book! Pretty please! I am sure the book would be very interesting. Would like to win it! Looks like this would be a book that would provide hours of fun. I would LOVE to win this Awesome book by Candie Cooper!! I am an avid Jewelry maker and Necklaces are what I love to make. This book would give me so many more ideas - I can't wait!! Not sure if I have signed up for this one yet or not....so I will try anyway. Looks yummie!!! This looks like a fun book that I would love to win. Please toss my name in the hat. I could use some new inspiration!! Thanks for the opportuity!! Looks like an awesome book, thanks for giving us the opportunity to win. Shared on FB as GemRio. Would like a chance towin this book, intriging title. Would love to win this book--so many different types of necklaces! I am a necklace beast. love to make em love to wear em. i would like to win this book to feed my addiction! I would love to win this book as I just started beading a week ago and I need some help!